I am a software engineer and need of a powerful machine to run my software development applications, for my purposes this machine is underpowered. Having said that for viewing chart software, accessing Inmarsat e-mail and receiving weather faxes it is perfect. The laptop has a large 15inchTFT display and a DVD player so it is also great for watching movies on. 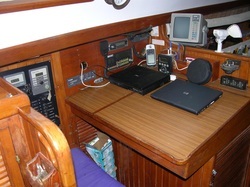 The computer normally sits at the NavStation held on with a bungee although I will leave some special tie downs especially for the purpose of attaching electronics in a pitching boat. There is a serial cable coming from an ABCD box just inside the main switch panel door. "A" connects the computer to the Trimble , "B" connects the computer to the SILVA server for running Navigation software and sending and receiving NMEA data. "C" and "D" are free for other devices such as digital cameras etc. As the computer was our primary source of navigation we needed a backup so we had a second laptop on board, even if you just keep this computer as your backup it still has some life left in it. For us paper charts were for emergency use only, we always had them but rarely used them. We had software which allowed printing of electronic charts for instances where we did not have the required original charts. See SGC for notes on Weather Fax retrieval. instruments off or change ABCD box. The computer needs a new keyboard. It can be operated via the mouse using the on screen keyboard but it is slow and cumbersome, my guess is new keyboard <$100, try e-bay, 4 screws on back and pry out with small screw driver from screen side. One of the screen brackets has snapped and hence I will leave my home made screen support device, not pretty but functional. A new bracket should be cheep to purchase if you fit it yourself. Don't be scared, just undo every screw you see and be gentle on the ribbon cables. The battery does not work, then again most batteries from computers of this vintage have given up the ghost long ago. The computer does not come with any licensed software other than some freeware for weather fax (JVComm32) and the Trimble/free MCC e-mail software. I need to keep my legitimate copy of XP and Office for my wife's computer and I sold my legitimate copies of Navigation software and world charts to a friend who wanted to be finally 'legal' after years of using copies. I have used MANY navigation programs during my 5 years sailing and would be happy to discuss options with you so please feel free to consult with me on this issue.